Sue's Blog - Some assembly required. : What whiskey? And this was before the whiskey tasting. 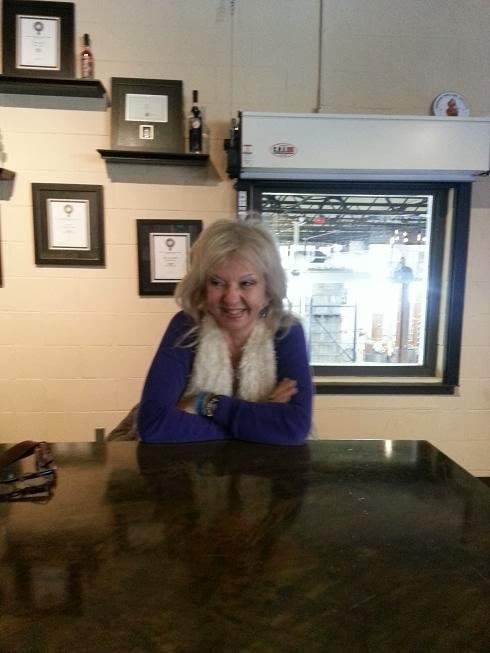 Saturday we visited the Milwaukee distillery. We went there during Alanmas two years ago when they had just opened to the public, doing tours etc. Well, they have greatly expanded and vamped up their tours & tastings since then so we went again. It was fun and very informative. After a very interesting tour and talk there were the tastings. They don't just make whiskey but make vodka, gin, rum and absynthe too. Philip was driving and did not partake in the libations, so I thought I would join Alan in sampling all they had on offer. They gave large samples too. Each shot was easily as big as a British optic measure (I know these things being a publican in a former existence). First were a couple of vodkas, a straight vodka and a citrus one. Me....yuk - and tipped it away. Alan....yuk - but drank it anyway. Alan....yuk - but drank it....what the heck. Me.....yuk - and gave it to Alan. Alan....mmm - and drank both..lovely. Next was their own whiskey. Alan....yumm - and drank both...hic! Now it was their whiskey & pumpkin blend. Alan....oh yush...loverly woverly - and drank both. Lastly was their rather large sample of absynthe. Me....sniff....yukkkkkky yukk yuk - and gave it to Alan. Alan...ooooh....sway.......sh'not that bad....yush.....grin ......I thinksh...I can...manage boths - and drank both. Alan was rather mellow for the rest of the day, bless him. I think I could have drunk a couple of them if I had been allowed to drown them in lemonade or something. Having gained new insight into the making of spirits we headed to the 'liquor store' where you buy the distillery's stuff at lower prices than they sell it themselves. This is a shame as you'd think their prices would be lower thus encouraging people to buy while they are there. Anyway, having bought the whiskey they make, Alan spotted a "White Whiskey". Philip and Alan were both intrigued by this and so a bottle was purchased. Later that evening Alan decided to try a 'wee dram'. It was more than pants, it was disgusting. Not one to give up easily, Alan tried mixing this noxious substance with various mixers. Nothing worked. Apparently, it was rough and raw and nothing tamed it. Philip had a go, confident that Alan was being a wuss and that he would be able to master the beast. He failed utterly. They eventually gave up and for the first time ever, booze was tipped down the sink. So, all was not lost. Our sink often gets a bit bunged up but I think those pipes are probably cleaner now than they have ever been and there will be no more blockages for some time. I did ask Alan what this shite, I mean white whiskey was called. As ever, the clue was in the name.